The value of owning a truly best camping cooler is not one you can underestimate. Like all your other camping gear, the cooler needs to be durable and weather resistant. The size of your cooler will depend on the size of the camping party, and it should be able to comfortably accommodate all the food you need to keep chilled for days on end. Investing in a great quality cooler will make a huge difference when you are outdoors. Check out our selections below to find the cooler that works best for your trip. Roy and Ryan Seiders were frustrated with the quality of cooler available when they founded Yeti in 2006. They set out to build the best coolers money could buy, and now the name Yeti is synonymous with quality. We agree that Yeti is the best brand for your adventures out in the wild, which is why it is the winning gold pick in this category. This cooler comes in five sizes: 20 quarts, 35 quarts, 45 quarts, 65 quarts, and 75 quarts. The many options on capacity have you covered for casual camping trips all the way up to group hunting excursions. All sizes come in the same off-white color. They are pricey, ranging from $250 for the smallest model all the way up to over $1000 for the largest. However, when you invest in a Yeti, you are making a commitment to your gear for the long-haul. All of them are fitted with roto-molded construction, a one-piece solid and durable plastic. What this will mean for you is not worrying about various bits of plastic always busting off your cooler as it’s moved between the car and the campsite. Surprisingly, YETI does not offer a lifetime warranty for their products, though scores of satisfied customers swear by their reliability. This is an important aspect to consider in your purchase. Depending on where you are camping, you want a cooler that can latch effectively not only from the weather but also from creatures in the wild that would like to help themselves to your dinner. It will keep your food secure, minimizing wildlife disturbances at night that might keep you on edge inside your tent. If you’re traveling to bear country you can utilize the integrated padlock ports to keep everything on lockdown. The Yeti coolers are known for the strength they offer, and with some of that strength comes to weight. Aside from the price, this may be the element of the Tundra that is occasionally griped about. However, it’s important to remember that the cooler is heavier because it contains quality materials that will help maintain a cool temperature for your food. This will help protect any investment you’ve made on food, which can be substantial for a long trip! You also will not find ice-melting right after you’ve got to camp, and will probably be able to keep the same ice for up to several days. Those searching for an incredible cooler to store freshly caught fish will be delighted with how long this cooler keeps their catch cold. When you’ve gone to the effort to catch your own dinner, the last thing you want is to risk it spoiling before it reaches the grill. The Yeti Tundra is a significant investment but an excellent choice. You’ll save time and money by not needing to deal with wasted food and frequent ice refills, and be able to enjoy wonderful eating even when you are far away from your kitchen at home. The Pelican Products 65-quart cooler is an amazing investment for any outdoor enthusiast. With amazing 2-inch thick polyurethane insulation and a freezer grade gasket, you’ll enjoy up to ten days of ice retention. Offering you a little personal flair with your purchase, this cooler comes in nine different colors that will appeal to any style of camper. Choose from the very popular army green color, or other fun choices like purple, dark blue, orange, or outdoor tan. Your choice in color may well depend on what environment you plan on using it in. The well-sized cooler retails for around $375 on Amazon and is backed by a very impressive lifetime guarantee. Fishing and outdoor enthusiasts alike will be delighted by some of the features of the Pelican Products ProGear Elite Cooler. The sleek finish allows for easy packing into a car without extraneous pieces that might break off in a small crowded space. The strong dual-handle system secures your cooler with molded-in and hinged handles that fold down flat for packing. Another great feature of this cooler is the wide press and pull latches that allow for easy access even while using gloves. These latches are extremely popular among customers who find them far more operable than the latches on other coolers. Instead of wasting time while out on a boat taking gloves on and off, you’ll be thinking about where to set down your next bait. Before any purchase, it’s a good idea to go over what size cooler you really need for your adventure. It’s designed to be a large workhorse that will keep your food and beverages very cold for an extended period of time, and it is a fantastic value for the price. 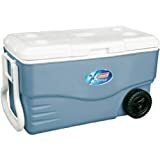 Coleman’s 6201A748 100 Quart Xtreme 5 is a heavy-duty and solid wheeled cooler at a reasonable price. At about $70 on Amazon, this Coleman is a classic design. This cooler has a huge capacity, able to hold up to 160 cans or six cases or soda or beer cans. Though it might be heavy once you’ve loaded in your refreshments and food, its base weight is only 18 pounds empty which is significantly lighter than some other coolers. Transporting this large 100-quart cooler is easy with foldable two-way handles and two large wheels. All of the Coleman Xtreme coolers have solid insulation in the lid and sides of the case that provides competitively long cold retention times. Your ice and supplies inside will stay cold for up to five days, even in 90 degrees Fahrenheit. The top of the lid has beverage holders which makes the cooler double as a side table for your drinks. This Coleman cooler may not have all the bells and whistles and the super thick insulation as the Yeti and Pelican Products, but it is quality. Coleman products have been some of the best since W.C. Coleman founded the company over 100 years ago. Though the company began with the iconic lanterns that have become part of their logo, now their catalog is full of quality camping gear. The wheels should certainly be another factor in your decision to pick this since higher-end coolers haven’t yet added wheels to their models. It allows transportation to be so much easier no matter what physical limitations you might have, you will not need a bodybuilder with you to help move your cooler to your campsite. The Rubbermaid Extreme cooler is designed to be the perfect go-to tailer-gate. It’s big, strong, and easy to transport. It’s also an incredible value for the money which makes it worthy to be our budget pick for this review. The Rubbermaid cooler has two wheels that allow easy transportation for your precious refreshments. Wheels and the extra large handles make for easier access for anyone not able to lift a heavy cooler, which might make this a very good pick for you if you have any problem with lifting heavy objects. This ample size cooler is able to accommodate your large parties with room for over 130 cans plus the ice that is needed to cool them. The tow handle and easy to grip side swing handles make this very easy for you to use even when you are on your own. Easy draining, easy transport, easy price. This cooler has built-in beverage holders that can fit not just 12-ounce cans but also 20-ounce bottles. It is designed to fit easily into your life and party. The insulation is comparable to even the most expensive coolers and will allow you to keep food and beverages cold for up to five days at temperatures up to 90 degrees Fahrenheit. There are multiple sizes available in the Rubbermaid Extreme line, but the 75-quart size will probably prove the most functional if you hold lots of parties in your backyard or go camping for more than one night. This large cooler is an inexpensive problem solver, with so much space to provide you ease while also allowing your pocketbook a bit of a break. Let’s be honest, car camping does not equate to backpacking. Not one of these coolers is really a choice anyone going out in the wild without a vehicle would choose, so it is important to decide on the qualities of a cooler that are most important to you. If you are car camping, especially with little children, consider transporting your most valuable asset, your food! When camping this is one of the most important considerations you could make. If you don’t have your kitchen sorted while camping you will be facing so much unnecessary stress. Buying the correct cooler for your particular locale is essential. Choose wheels if you can’t easily transport a heavy cooler by yourself. If you are going fishing, it’s doubtful that we need to remind you of the value of your catch. There’s been a lot of coolers designed to keep the fish you catch cool until you can eat them on your own grill or in the kitchen. But only a few are truly designed for fisherman. If you are looking for a permanent cooler for your fishing boat you need to invest in the product with the absolute best insulation and easiest to use hinges. You should try out the hinges, opening and closing your cooler, with gloves or whatever gear you’ll have on. Spend time with friends on boats and you will discover what the most important elements of your fishing cooler should be. It’s important to remember the shift in weight that will certainly occur when you pack your cooler with ice and goods. It’s equally important to determine how you will plan on transporting that cooler. Depending on what activity you decide to indulge in the weight will significantly increase. Many high-quality coolers have dual handles are easily handled with two or more persons transporting your precious food cargo. It may be an option to also bring a hand-truck if you feel the need to go for a cooler without wheels. But its also important to understand the benefit of portability for your own enjoyment of your vacation. Consider how you will secure your cooler to the outdoor of your vehicle if you plan on transporting it outside of your vehicle. Most models come with built-in harness holds to help you secure and ratchet down your cooler and keep it from moving when on the outside of your vehicle. Most of these coolers come with guarantees about how long ice will last and your beverages will stay cold. But if you are headed out on a week-long camping trip, beverages are not what you are concerned with. You need a refrigerator that you can transport with you, to feed and sustain your friends while you enjoy your time outdoors. All coolers will function best when filled to capacity, so consider what you pack and fill that cooler to the best of your ability. Most if not all of the coolers rated here will be able to provide for a large group of people for a long amount of time, but depending on your diet and what’s on the menu, some may be more functional than others. Camping is an excuse to let go of your worries and create a new home in the outdoors. Food is such an important element of that equation, providing you with sustenance and joy as you enjoy a meal over the bbq with friends and family. Your cooler is your kitchen when you are camping. It is possibly the most essential part and choosing the right cooler is a very important decision. Consider your most frequented camping locals, your vehicle, and the exact amount of food you need to transport, and one of these coolers will be the perfect fit for your trip.